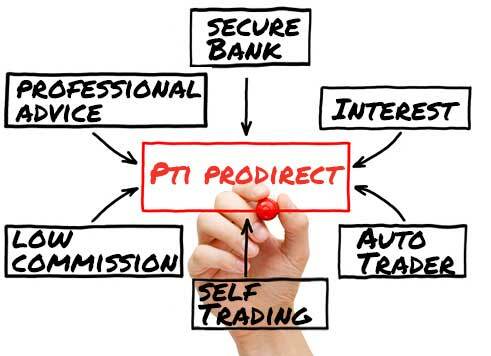 IB’s trading platform makes it possible for PTI ProDirect to offer deep discount commissions, competitive price execution, payable credit interest and margin interest rates while still having access to professional trading advice. Integrated technical, fundamental and price/risk analysis tools. Real-time margin and activity reporting. Flexible reporting options including our FlexStatement, which allows you to create a customized downloadable file. in-house enabling us to offer low commissions, and margin rates. pays interest. View the current interest rates here. time of your order, and unlike other routers, dynamically routes and re-routes all or parts of your order to achieve optimal execution. IB independently routes US stock, option and futures spread order legs to the competitive possible venue or natively routes your combination seeking price improvement, with IB undertaking the risk of partially executed orders. SmartRouting Autorecovery re-routes your US options orders in the case of an exchange malfunction, with IB undertaking the risk of double executions. Learn about Interactive Broker’s financial strength & account protection. Learn how our unique risk time margin and risk navigator can help you control your risk. Investigate how our multiple platforms, trading tools, and ‘Smart Routing’ Execution System provides a superior trading experience. Get access to trading tips and software demos through the daily market briefs, live webinars, interactive tours, etc. Confirm IB’s financial strength through its financial statements. Improve your decisions and trade execution speed through IB’s Smart Routing tool.